Build a Scale Rubber Powered Cessna O-IE Bird-Dog South Vietnam "FAC" Plane (Forward Air Control) with this Balsa Construction Kit from Guillow's. Scale Model Suitable for Ages 10 and Older. This is a Walnut scale, Rubber-Powered, Nieuport 27 18" Airplane Model from Dumas. For Beginners Learning How to Build & Fly or the Advanced Modeler. 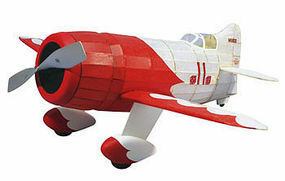 This is the GEE-BEE R-1 Racer rubber band powered model from Dumas Aircraft. This is a 30" Wingspan-Scale, Rubber-Powered, DH C-2 Beaver Flying Model. For Beginners Learning How To Build & Fly Or The Advanced Modeler. Build a Scale Rubber Powered Hawker Mk.IB Typhoon with this Balsa Construction Kit from Guillow's. Scale Model Suitable for Ages 10 and Older. Build a Scale Rubber Powered Grumman TBF Avenger U.S. Navy World War II Torpedo Bomber with this Balsa Construction Kit from Guillow's. Scale Model Suitable for ages 10 and older. This is the AT-6 Texan 30" Rubber Powered Airplane Kit from Dumas. This is the British S.E.5A Airplane from Guillows. Suitable for Ages 12 & Older. This is the Spitfire Britain's Top WWII Fighter from the Scale WWII Fighters Series by Guillows. Suitable for Ages 10 & Older. This is a Giant 3/4" Scale Balsa Grumman F6F-3 Hellcat Flying Model Kit from Guillow's. For Experienced Modelers. 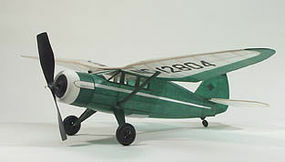 "Piper Super Cub 95" is a Build-by-Number Balsa Wood Construction Kit from Guillow's. Rubber Powered Semi-Scale Flyer Suitable for Ages 10 and Older. A Guillow "Junior Contest" Flying Model Airplane. 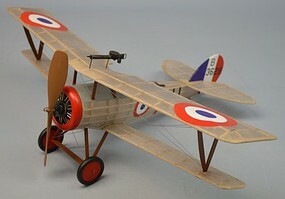 This is the 1/14th Scale Guillows Fokker DR-1 Triplane Balsa Wood Kit. Introduced over the Western Front in August 1917, the Fokker Triplane became the favorite of Germany's greatest WW 1 Ace, Baron Manfred Richthofen. This is a Rubber Powered Flying Scale Model of the Beechcraft Bonanza by Dumas Aircraft.